Jobs in Washington: What now? Beginning in May 2010 and continuing for almost three years, aerospace employers in Washington State added to their payrolls at the rate of nearly 600 a month. Over eight months starting in April 2011, the pace of hiring was almost frantic, averaging about 900 a month, as Boeing scrambled to get the tardy 787 Dreamliner ready for prime time. As the chart shows, the cumulative increase in the sector reached 17,200 in November of 2012, up 21 percent from the cyclical low. This hiring spree, with a little help from Amazon.com, helped halve the unemployment rate in King and Snohomish counties. It was a major factor in reducing Washington’s employment rate from more than 10% to 7%. But you can hardly pick up a newspaper or tune in a newscast these days without encountering another item about Boeing shifting jobs from the Puget Sound area to sunny California or to right-to-work South Carolina. Or simply laying people off because catch-up on the 787 has been accomplished. 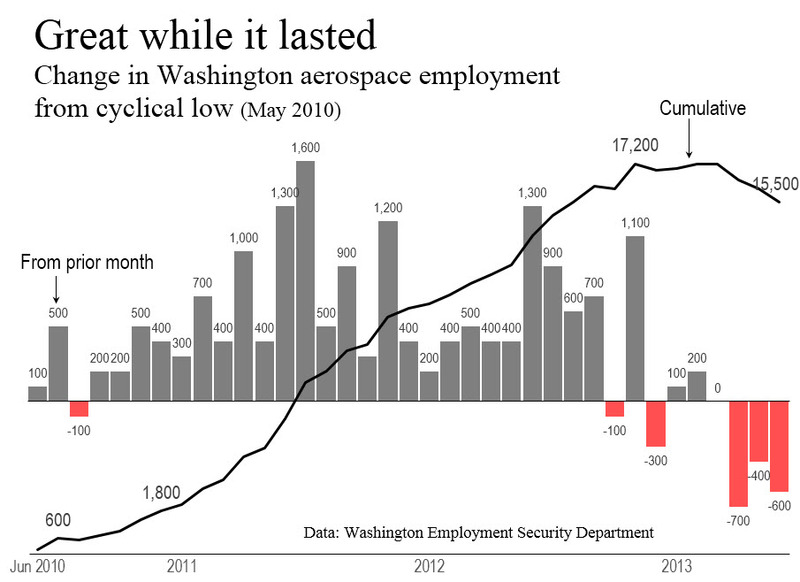 Aerospace employment has a roller-coaster history in Washington. It is clear that we have passed the apogee and are headed south. It goes without saying that aerospace jobs will be extremely difficult to replace. Average pay in the sector was over $100,000 in 2012, not quite twice the statewide average for all jobs. The global economy is slowing. After two decades growing at or near double-digit rates, China, with the world’s second-largest economy, may have trouble this year achieving growth of 7.5%. The magazine The Economist reports that emerging economies will grow this year at only about 5%, the slowest rate in a decade except for 2009, when the economies of rich countries almost collapsed. Where will new high-wage jobs to keep Washington’s economy growing at above-average rates come from? I wish I knew.